Home / How to / tutorials / social / Social Media / How to send mail using Yahoo,Hotmail,etc... from your gmail account? How to send mail using Yahoo,Hotmail,etc... from your gmail account? Integrating Yahoo!, Hotmail, etc... in Gmail. Sometimes we want to send mail using our professional mail ID and our net speed is slow such that we cant even afford to open our email in a new window/tab. So you can send a mail using Gmail as using professional email ID. Gmail loads faster then any other mail service. You can integrate your Gmail with your yahoo mail account or any account. All you need is to do follow these simple steps. 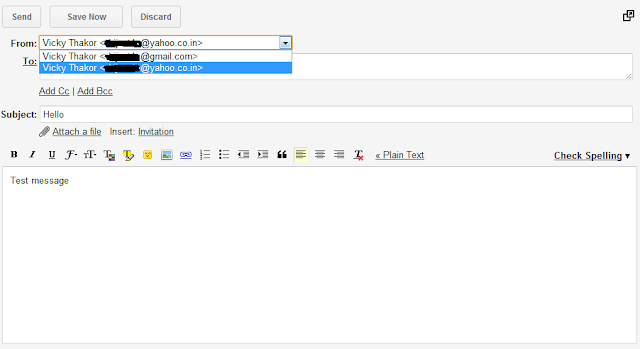 Below step show how to integrate any email with your Gmail Account. Step 1 : Go to your Gmail mail settings. Step 4 : Clicking on Add another email you own will pop out the window. Feed the name and email ID you want to integrate. Step 5 : Provide password of new email ID that you want to add. Here like i have to feel the password of yahoo. - Click on Add Account. It'll send you the conformation code on your Yahoo! or your new account that you added. Now you can send mail from Gmail using Yahoo ID. You can add many more account to it by following above steps.